The Justice Department released nine long-secret legal memos from the early days of the Bush administration’s "war on terror" today, including five that we’ve had on our list of the memos. The newly released memos asserted broad powers for the executive branch following the Sept. 11 attacks, and include several that drew harsh criticism from Congress and civil rights groups. One argues that if the president deployed the military within the United States to fight terrorists, Fourth amendment protection against warrantless searches would not apply. Another memo concludes, "The President has since the Founding era exercised exclusive and virtually unfettered control over the disposition of enemy soldiers and agents captured in time or war." Several of the newly public memos were repudiated by the Bush administration’s Justice Department days before they cleared out. In the press release announcing today’s disclosure, the Justice Department said it had as recently as November filed court motions to keep two of the now public documents secret. Those two, the memo disputing the Fourth amendment’s applicability, and another that broadened the use of the Foreign Intelligence Surveillance Act, are among the first Bush legal opinions to be made public that shed light on the top-secret Terrorist Surveillance Program, the official name for the warrantless wiretapping program. Another memo included in the disclosure was so buried that few were aware it existed. (That’s why it never made it on our list.) The memo, authored by then Assistant Attorney General Jay Bybee on Jun. 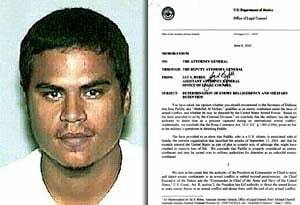 8, 2002, asserts the president’s authority to seize and detain a specific U.S. citizen, Jose Padilla, as an enemy combatant. The ACLU has sued to government to release this type of document, but the Padilla memo wasn’t mentioned alongside the others memos cited in court filings. "Americans deserve a government that operates with transparency and openness," said Attorney General Eric Holder in a Justice Department statement today. "It is my goal to make OLC [Office of Legal Counsel] opinions available when possible while still protecting national security information and ensuring robust internal executive branch debate and decision-making." We checked the five memos off our list today, but there’s still at least 35 other opportunities for Holder to fulfill that goal.